When I was in 7th grade, I gave my class picture to a girl I really liked. Because that’s what you did back in the 90’s, and I was probably wearing Zubaz, and listening to Hootie and Blowfish at the time. Well she giggled and probably went back to feeding her Tamagotchi pet, and she slipped the picture I gave her into her back pocket. And I didn’t know this in that moment, but the picture didn’t make it into her pocket, and instead landed on the floor of a middle school hallway. And it didn’t stay on that sticky, influenza covered ground for long. Because I was sitting in class later that day, and I saw a group of kids across the room looking at me and laughing. And one of them passed something underneath the table to someone else. I was mortified. The rest of that day I tried to hide from everyone and sneak between classes without being seen. I went home that night never wanting to go to school again. I didn’t want to face another day of shame and embarrassment. But that night, my friend called me, on this strange device attached to the wall in my kitchen, and said that he got a hold of the picture and would destroy it for me. And the next day at school, a couple people gave me a hard time, but the photo evidence was gone, disappeared, and most people moved on pretty quickly. It still hurt for a bit, but my world kept spinning. Nowadays, when an embarrassing or revealing picture or post gets put online and spread around, it doesn’t just disappear. When those kids found my picture and passed it around, some of them used it as a weapon to hurt me in a way. With the ever-changing world of digital technologies, the weapons have got a lot stronger. They’re sometimes lethal. Suicide is the 3rd leading cause of death among teenagers, and cyberbullying is causing more and more of them every year. I’ve heard too many stories of rumors flying around about my students, kids in my class who I care about getting slammed and shamed online. And sometimes I don’t think it’s with malicious intent. The anonymity of the internet makes it so easy to do major damage. A simple retweet or clicking “like” can send a rumor or a picture to thousands of people. But I think there’s something teachers can do about it. 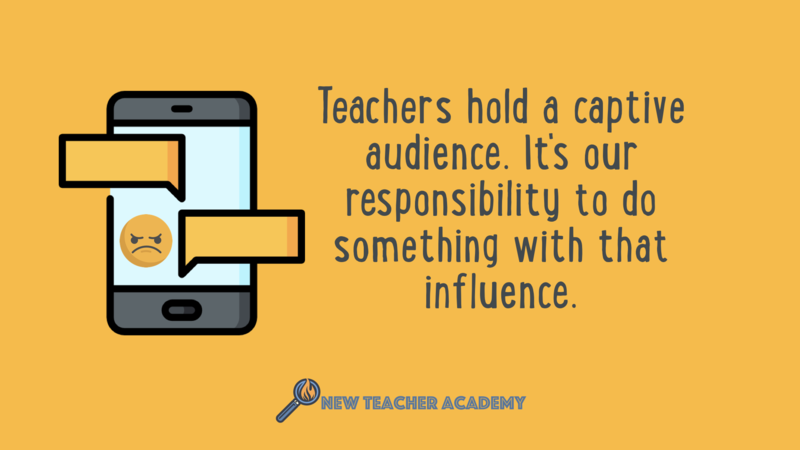 Teachers hold a captive audience, and what we say has a tremendous impact on our students. While not every word we say is retained by the kids in our classes, students are often listening. Instead of just using this influence to teach math, science, English, and history, teachers also need to speak out against destructive practices like cyberbullying. Hold class discussions about it. Share suicide statistics. Get on a pedestal every now and then. It’s easy to think that everyone knows the consequences of cyberbullying, but many do not, and the classroom should be a place for them to learn. I’ve overheard students talking about friends of theirs being targeted online, and even about how they themselves are targeting a certain person. My temptation is to ignore what I’ve heard and avoid getting involved in students’ problems. However, this only allows abuses to continue. Adults need to report cyberbullying when they see it and do everything they can to end it. In every situation I’ve been in to report or deal with what I’ve seen, the victim of the bullying appreciates the support. Students should know that no matter what, their teacher has their back. Teachers and administrators can definitely help to prevent cyberbullying in schools, but no one is as influential as the students. Students should be empowered to be leaders who stand against mean behavior online. Encourage kids to report abuses, stand against bullies, and comfort those who are attacked. Anti-bullying groups and organizations are good and should be encouraged, but the most impact comes when students feel empowered to stand against it in their own social circles. When the girl in my class was targeted online this week with damaging rumors, she felt alone and ostracized. She felt as if her reputation was ruined and that she had no place in our school. But then another girl in my class put an arm around her and assured her she is not alone. Following this example, many other students gave this same assurance, and essentially denounced what was said on social media. A teacher has many roles, but probably the biggest is ensuring the safety of their students. Because of the internet, this is more difficult than ever before. However, it’s also more important. Get the New Teacher Toolbox with resources for classroom management, the first week of school, and organization. It even includes a suite of assessments and innovative projects you can use out-of-the-box. You'll also have access to the weekly updates with articles, tools, strategies, and resources you can use in your journey from surviving to thriving as a new teacher. We equip new teachers with the tools and strategies to move from surviving to thriving. We believe you can be "different from day one" by experimenting and innovating as a new teacher.